Want more reasons to play Apple Valley? Click the coupon to the right and you'll be able to download a printable PDF coupon to use today or whenever you choose! Did you know we oftent have off-time discounted rates on our 'Internet Specials' calendar below? These can be booked online, very easily, and no coupon is necessary. 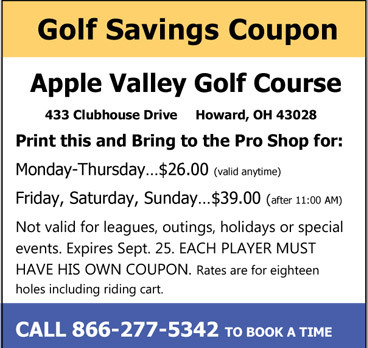 So check back often for many extra reasons (and savings) to play Apple Valley Golf Club!